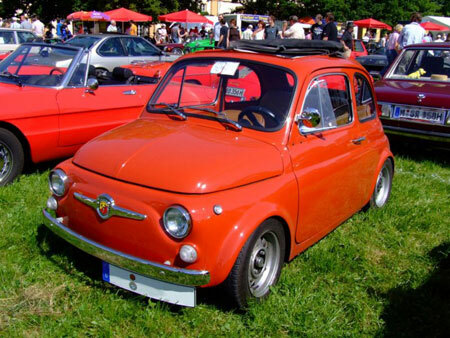 Now, in the span of over 30 years since the last Fiat 500 rolled off the production line in 1975, what do you think fans of the Fiat 500 have been doing? Restoration and outright pimpage of course. Introducing the Prancing Mouse – a Fiat 500 done up at the former premises of the Arrows F1 team at Leafield, rechristened the F500. The Fiat F500 Prancing Mouse is built by Hartham, a race car constructor, will do 0-100km/h in under 4 seconds and hit a top speed of 193km/h. The Fiat F500 trades in it’s tiny 2-cylinder boxer engine for an L-Twin superbike engine from the Ducati 999R – an fuel injected liquid cooled 999cc Testastretta Desmodromic 8 valve making 150hp at 9,750rpm. The engine is also available in a higher state of tune churning out 200hp, and this is mated to a sequential 6-speed gearbox. The tiny brakes for a tiny car have been replaced with Brembos, and the chassis is a carbonfibre composite. Yes, another car powered by a bike engine. Production of the Fiat F500 is strictly limited to 500 units. More technical specifications after the jump.